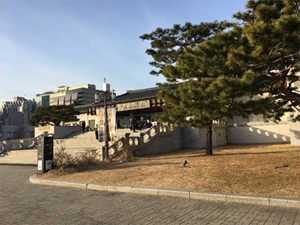 On December 21st, 2018, the 2018 East Asia ICOMOS Workshop “Towards a New Exchange and Cooperation: The Recent Practices of East Asia ICOMOS in the Protection and Management of Cultural Heritages” was held in the National Palace Museum of Korea in Seoul, the Republic of Korea. This workshop was organized by the ICOMOS-Korea and sponsored by the Cultural Heritage Administration of Korea, with the aim of outlining policies and methods related to the protection of cultural heritages in Japan, China and Korea and examining how the ICOMOS participates in and contributes to these activities. As requested by the ICOMOS-Korea and Cultural Heritage Administration of Korea, I reported the activities of Tokyo National Research Institute for Cultural Properties related to the World Heritage under the title of “Activities of Tokyo National Research Institute for Cultural Properties for a good implementation of the World Heritage Convention.” In this report, I presented our activities such as the publication of survey research reports and glossaries related to the World Heritage Committee and the organization of the World Heritage Seminar. I explained that these activities aim mainly at providing information to local government officers who are involved in the recommendation and protection of the World Heritage Sites, and that they are conducted in cooperation with the Agency for Cultural Affairs of Japan. Masahiko TOMODA of the Institute also participated in the workshop as a member of the Japan ICOMOS National Committee and reported its activities with the Vice President Yuga KARIYA. 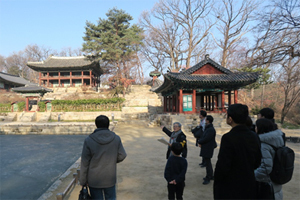 Korean participants said that they also find it challenging to provide information related to the World Heritage Convention to local government officers. Politicization caused by the overheating interest in the World Heritage Sites seemed to be a common issue in Japan, China and Korea. I hope that the exchange with experts from nearby countries, as in this workshop, will lead to the creation of highly specialized recommendation documents and the appropriate protection of World Heritage Sites in each country. 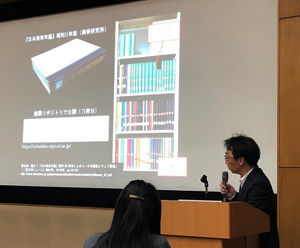 On December 2nd, 2018, Hideki KIKKAWA and Tomohiro OYAMADA presented the database of Tokyo National Research Institute for Cultural Properties in the session “Data for Historical and Humanities Research (www.metaresource.jp/2018jmc/)” at the JinMonCom 2018 organized by the IPSJ SIG Computers and the Humanities, one of the research groups of the Information Processing Society of Japan (IPSJ). This session was aimed at introducing databases that are not widely recognized yet in the IPSJ and promoting more active data use. KIKKAWA and OYAMADA presented the system overview of the TOBUNKEN Research Collections (www.tobunken.go.jp/archives/), the database of photographic negatives and plates which is the largest among our image databases, and the database of Art exhibitions and Obituaries which is based on the Year Book of Japanese Art published since 1936. 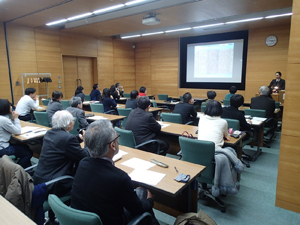 Additionally, various databases published by the National Diet Library, Shibusawa Eiichi Memorial Foundation, Tokyo National Museum, the University of Tokyo and Aozora Bunko were presented and attracted the attention of the participants. In addition to publishing and managing the database of cultural properties, our Institute will make further efforts to spread the database of cultural properties and make it useful for survey/research. The Department of Art Research, Archives and Information Systems held the 7th Seminar with two external speakers on December 27th, 2018. 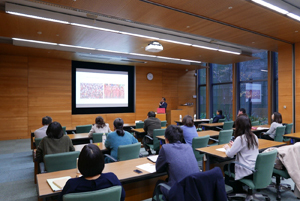 The first presentation entitled “Origin of the Scrolls of Diseases – ‘Illustration of Lotus Sutra’ owned by Seikado Bunko” was given by Dr. Satomi YAMAMOTO of Kyoritsu Women’s University, and the second presentation “Takashina style in ‘Mandala of Kasuga Shrine’ owned by Seikado Bunko Art Museum” was given by Prof. Masahiko AIZAWA of Seijo University. They focused on the two collections of Seikado that deserve the attention but are not widely presented yet. According to Dr. YAMAMOTO, it can be deduced from the ending prayer that the ” Lotus Sutra” in Seikado Bunko, illustrating sutra on the head of the scroll, was created in 1140 (Shaoxing (Shoko) 10) by 40 people who made a Buddhist connection with each other and were led by Daoyin (Doin) of the Tendai sect of Buddhism who was active in the South Song Dynasty in the mid-12th century. She explained that its Biyu Chapter (Hiyu-Bon) illustrates a sick person who receives a bowl of medicine and the Lotus Sutra states that people who vilify the sutra would suffer from sickness such as dwarfness, hunchback and bad breath, which are illustrated in the “Illustration of Lotus Sutra.” Additionally, she made interesting remarks that the National Treasure “Yamai-no-Soshi,” drawn from the late Heian period to the Kamakura period, may have been inspired by the text of the Lotus Sutra and this illustration of the Lotus Sutra in Seikado Bunko, and that the creation of “Yamai-no-Soshi” must be considered while taking into account the situation of Japan and China in the 12th century, the worship of the Lotus Sutra, and the relationship between monks and general worshippers then. More than 20 external attendees attended the seminar, and it was very meaningful. Seven staff of our Institute, including the Deputy Director General Emiko YAMANASHI, participated in the “Asia-Pacific Regional Workshop on Intangible Cultural Heritage and Natural Disasters” co-organized by the International Research Centre for Intangible Cultural Heritage in the Asia-Pacific Region (IRCI) and our Institute and held in Sendai on December 7th to 9th, 2018. This workshop was conducted as the conclusion of the “Research on Intangible Cultural Heritage (ICH) Safeguarding and Disaster Risk Management in the Asia-Pacific Region” conducted by the IRCI since 2016. Additionally, the Department of Intangible Cultural Heritage of our Institute cooperated in this project and dispatched staff for field surveys in Vietnam, the Philippines, and Fiji. Cultural heritage and disaster risk management experts from eight countries in the Asia-Pacific Region were invited to this workshop. Together with experts from Japan and other countries, they reported and discussed how to protect intangible cultural heritage from natural disasters. 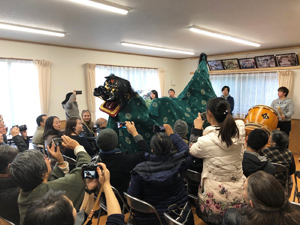 On the second day, Hiromichi KUBOTA of the Department of Intangible Cultural Heritage conducted an excursion to Onagawa-cho, Miyagi Prefecture, to show the participants the roles the intangible cultural heritage played in the reconstruction after the Great East Japan Earthquake. Each country and region’s seemingly different perception of the relationship between intangible cultural heritage and natural disasters marked the discussions in the workshop. For example, while Japanese experts emphasized that intangible cultural heritage formed a bond in the disaster-affected communities and became a source of strength for the reconstruction, several foreign experts highlighted that traditional knowledge contains knowledge to forecast and prepare for natural disasters. The UNESCO Convention for the Safeguarding of the Intangible Cultural Heritage lists “knowledge and practices concerning nature and the universe” as a form of intangible cultural heritage, and traditional knowledge is generally recognized as intangible cultural heritage. On the other hand, Japan’s Act on Protection of Cultural Properties does not clearly consider traditional knowledge as a category of intangible cultural properties. In Japan, attention has been paid to the folkloric records and knowledge related to natural disasters, such as tsunami monuments; however, they were not much discussed in the context of the relationship between intangible cultural heritage and natural disasters. This workshop was a meaningful opportunity to know different perceptions from each country and region, discuss with people who have diverse ideas, and widen our perspective. The seminar entitled “Safeguarding Living Heritage in Nepal” was held on December 10th, 2018. The Director General Jaya Ram SHRESTHA and the curator Yamuna MAHARJAN of the National Museum of Nepal were invited and spoke on the current situation and challenges of intangible cultural heritage in Nepal. Tomo ISHIMURA and Hiromichi KUBOTA (Department of Intangible Cultural Heritage) also presented the surveys on Nepalese intangible cultural heritage conducted by our Institute. Dr. Tomoko MORI (Sapporo City University) who has been involved in the preservation of urban scenery in Nepal gave comments as well. Diverse ethnic groups and religions coexist in Nepal, which has given birth to abundant intangible cultural heritage. However, the earthquake of April 2015 caused severe damage in many regions and affected traditional cultures to no small extent. Moreover, the rapid modernization in recent years is forcing traditional cultures to change. We spent meaningful time learning about such situation of the Nepalese intangible cultural heritage, sharing information with Japanese experts on Nepal who attended the seminar, and exchanging ideas with Nepalese experts. This seminar was held as part of the Project “Technical Assistance for the Protection of Damaged Cultural Heritage in Nepal” which is the Networking Core Centers for International Cooperation in Conservation of Cultural Heritage Project commissioned by the Agency for Cultural Affairs in FY2018. 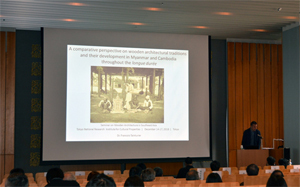 Since 2017, Tokyo National Research Institute for Cultural Properties has held three seminars on the topic of wooden architecture in Southeast Asia. The first and second seminars were focused on clarifying the features of already lost ancient wooden buildings through archaeological data. The third seminar was held on December 16th, 2018 under the title “Wooden Architectural Techniques in Mainland Southeast Asia: Development and Mutual Influences”. This time, the objective was to analyze the features of existing buildings in order to deepen our understanding of wooden architectural techniques, their development, and the influences both inside and outside the region. Mr. François Tainturier, from the Inya Institute of Myanmar Studies, made a presentation about Myanmar and Cambodia. Wooden architecture in both these countries is characterized by the use of a simple structural framework, with few horizontal members, supporting straight multi-tiered roofs. Especially in the case of Myanmar, roofs are profusely decorated with carvings. Mr. Pongthorn Hiengkaew, from the Fine Arts Department, Ministry of Culture of Thailand, made a presentation about wooden buildings in Thailand. Although their features vary depending on region and period, as a common feature, horizontal members and struts are employed in order to create roofs with curved shapes. Finally, questions from the audience were answered and a panel discussion was held with the participation of Mr. Shoichi OTA, from the Kyoto Institute of Technology, with the objective of laying the foundations for a history of wooden architecture in Southeast Asia beyond current national divisions. The proceedings of this seminar will be published next fiscal year.